Living with a serious condition can be challenging. From consistently watching diets, checking blood sugar levels, and taking insulin shots, individuals who suffer from Invokana and Type 2 diabetes know the challenges all too well. Did you know that there are over 3 million cases of Type 2 diabetes that arise in the United States every year? If you have a loved one who suffers from diabetes, then you know how serious and life threatening this condition can be—especially if left untreated. Who Gets Type 2 Diabetes? How is it Caused? Type 2 diabetes is a condition that affects mostly adults. Children can also be affected, but these are cases aren’t as common. Type 2 diabetes is when the body has a problem with maintaining healthy blood sugar levels. Type 2 diabetes can be controlled with proper diet, exercise, and medications, in addition to manually supplying the body with insulin. In fact, many medications available help to reduce blood sugar levels to healthy levels. One popular drug that can help maintain blood sugar levels is Invokana. Studies and reports have shown that the drug Invokana can do more harm than good. In May 2015, the U.S. Food and Drug Administration (FDA) issued a warning regarding the usage of Invokana. Reports have shown that patients who take Invokana have higher levels of blood acids, which is also known as diabetic ketoacidosis. Diabetic ketoacidosis can cause brain swelling, kidney failure, and cardiac conditions. In the 20 patient cases that were studied, all cases involved hospitalization and emergency care. It was also determined that the patients in these cases were all taking Invokana at the time of hospitalization. In December 2015, the FDA finally began to crack down on Invokana manufacturers. Before the FDA got involved, the only known and proven risks and side effects from taking Invokana were serious yeast infections and urinary tract infections (UTIs) due to the higher levels of sugar in the bloodstream. However, the FDA then required that manufacturers update drug labels on all bottles and packaging to include warnings and risks of diabetic ketoacidosis. 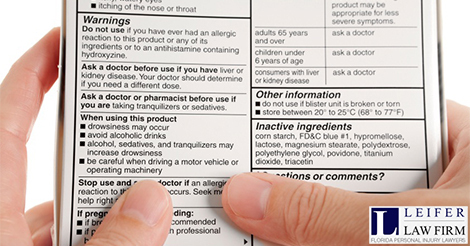 Check out this site here to read more about FDA drug safety communication about Invokana. Once word got out about the risk and complications from taking Invokana, and the FDA required that manufacturers update drug labels, patients then began to pursue lawsuits and legal action. The legal team at Leifer Law has experience in defending victims and consumers who have been seriously harmed, injured or even passed away from taking dangerous drugs. Visit this site here to read more about dangerous drug cases. Leifer Law offers free consultations and case evaluations, so call us today at 561-440-8534 to talk to us about how you have been harmed by taking Invokana or another dangerous drug.